One of the best things about being a vintage perfume fan is finding a tiny, hand-labeled vial of vintage fragrance with a date on it that goes back a few decades. Then squealing excitedly about it, unstopping the vial and lightly coating my skin. The best part is obviously enjoying that wonderous, heady, classic smell that all vintages tend to have. That beautiful thing that makes me imagine what the history behind the scent must have been like. That smell that I think everyone–whether they’re perfumistas, fans of perfume, or just people who are just curious about perfumes in general–need to smell. Whether or not they like it is besides the point. There’s just something completely awesome about smelling history. Did I forget to mention that I love vintage perfume ads too? Just beautiful stuff. Whenever I get to wrangle someone into sitting and smelling stuff with me, I’ll pull out all the stops from the recent stuff that I know they’ll probably like and work them up to some of my most precious collections of old stuff. Hidden away from light and air and major temperature shifts, this old stuff is what I consider to be the real treats. Much to my amusement (and bemusement), most people wrinkle their noses at the vintages. Once in a while, one of my non-perfume crazy friends will be delighted because they think it’s awesome to be smelling something classic. But the most joy I got from sharing my vintages was when I converted one of my friends over to my addiction. Her initial reaction to it was that it was strange, too strong and that it probably wasn’t for her. She kept on the perfume thing, amassing bottle after bottle of mass market, then got more adventurous with niche fragrances. When her and I met up again for a perfume sniffing get-together, she sampled the same vintages I gave her the first time and discovered that not only did she grow an appreciation for the stuff, but that most of it was downright enchanting. I started out in much the same way. Finding vintages a little strange, too heady, too strong or bitter. After a couple of years, I couldn’t get enough of the stuff and needed more. Maybe it was because I started out like most young women, liking the Burberry offerings and finding perfumes that smelled like food to be a delightful novelty. So I went and got a bunch of fruity, floral things and wore them. It may have also helped that I blogged about my experiences and maybe it was because I had easy access to some more complex fragrances from the get go thanks to my mother. Whatever it was, I discovered that fruity florals and most teeny gourmands were…well, kind of boring. Maybe it was because I kept smelling those same fruity florals and gourmands everywhere. Or maybe it was because after smelling like a vanilla cake for a few months, I started to be turned off by sweet, sugary things and wanted something else with a little more kick. After all, it’s not all that fun to smell like everybody else–or have your dog look at you accusingly because he thinks you ate a cake that he would have liked to stare at and whine about first. These days, I look in antique stores on the faint hope of finding an intact bottle with beautifully preserved juice inside of it. I don’t go antiquing often, my husband being of the mindset that he’d really rather get new things than old things (weird), but when I do go, I often see stuff of the non-perfume variety. Just as well, I suppose. I mean, the bills still need to be paid. I also find it incredibly hard to walk away from a vintage fragrance. I need to smell it. I need to know what it was like. I think it’s because those vintages were better built. But then, I’m biased, and mass market fatigued. Mostly, I’m tired of the berry candy openings, and the faux rose middles, with finishing splashes of plastic vanilla. At this point, I’d much rather be accused of smelling “old” and while knowing that fine fragrance is an artwork, than being told that I smell nice because of Cupcake Explosion No.45 by Faceless Celebrity. Heavens know, Justin/Selena/Katy/Gaga/et al. don’t need any more of my money. So maybe vintage isn’t for everybody. But it’s got a way of winning over people who’ve been mired in the scent scene long enough to get fatigued from all the modern fruity florals, the floppy, same-y flowers, and the boring vanilla sandalwood dry down. 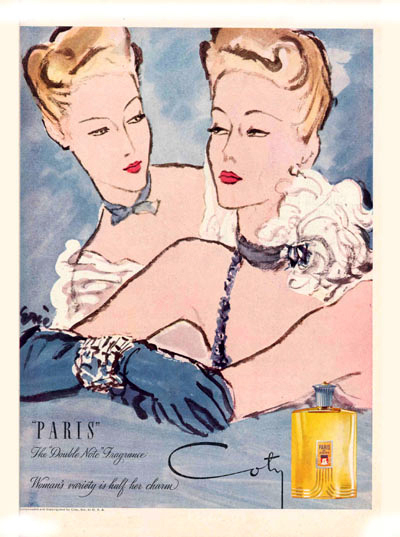 Now, the next best thing about being a vintage perfume fan is watching your friends who enjoy the latest and greatest in mass market fragrances look on it horror as you slap some decades-old juice on your skin. One of my friends actually cringes when she sees me do this, like the old perfume might turn me into some sort of swamp thing. Her loss.